Mossy Glen Cave is a small, unmarked bear den only accessible via Dayspring Canyon. It is a natural cave with several stone pillars and plant matter throughout the cave. There are two entrances, the first of which is found by heading uphill on a path to the north. When you reach the point along the path where you can first see Fort Dawnguard, there is a snowberry bush outside this entrance. The second entrance is easier to find. 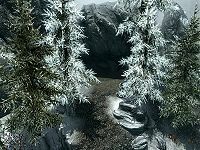 Heading from Fort Dawnguard, when the path reaches its first switchback, keep going due north, and you will pass between wooden plisade wall sections; the entrance is in the northern corner behind some trees. There are two snowberry bushes by this entrance. The cave is full of vegetation that makes seeing quite a challenge. Entering via the first entrance leads into an area where there is a skeever. On the second ledge along the wall to your left, there are two unlocked chests with minor loot. In the northernmost room, there are four leveled bears. After defeating the bears, check the west side of the room for another unlocked chest containing minor loot. On the east side of the cave, a narrow tunnel leads from the second entrance. As it opens out there is another narrow tunnel directly opposite, this leads you to the open area by the skeever. A white cap and five bleeding crown fungus can be found inside the cave. This page was last modified on 9 January 2016, at 22:58.